This comfy 1 bedroom, 1 bath apartment/cottage is attached to our home, but has a separate entrance and patio. It sleeps three comfortably and features wood floor throughout, central heating, and wall A/C, and a brand new fully equipped kitchen for cooking. Fully furnished with the finest attention to details. New top of the line comfortable king mattress/bed in the bedroom, a comfy futon in the living area. High speed internet, Two flat screen high defintion TV's with movie channel line up & iPod/Bluetooth speaker. Charcoal grill outside on the veranda. Several games & books can be found in the game closet, as well as pamphlets to the local attractions! Downtown Milwaukie waterfront is 18 blocks away and features several quaint shops and restaurants. Providence Milwaukie Hospital is 13 blocks! Portland & Tom McCall Waterfront Park is less than 15 minute drive. This park is home to many annual events, including the Portland Rose Festival, the Oregon Brewers Festival and the Waterfront Blues Festival! The Springwater Bicycle trail is a short 5 minute ride away. You can ride to downtown Portland or East to Gresham and the city of Boring. The downtown route takes you through the beautiful town of Sellwood and along the Portland you can ride across two bridges that are for pedestrians and bikes only! We are about 6 minutes from Sellwood area featuring antique shops, amazing restaurants, a beautiful waterfront area including the historical "Oaks Amusement Park and Skating Rink" built in the early 1900's! Mt. Hood is a short 60 minute scenic drive. We have close access to I-205 which will shoot you down to the famous Multnomah Falls and the panoramic Columbia Gorge in close to 25 minutes! This cozy, quaint, quiet apartment/cottage includes a private entrance & outdoor sitting area for relaxing before or after a long day. Two Bicycles included upon request! My hubby and I have been married and laughing for 36 years! My parents owned this home and we recently purchased it! We renovated the in-law quarters to be quaint, clean and quiet. We love the outdoors and love to bike & ski. The Springwater Bike Trail is a short 5 minute ride to the Johnson Creek entrance, so year round we spend much time on our bikes on the trail. The bike trail goes along the Willamette River into downtown Portland. It also goes to Gresham and Boring. It use to be the old cable car rails. My mother rode the cable car as a child and teenager, and now I ride the trail on my bike. We often ride to the famous "Oaks Amusement Park" with its famous skating rink where my parents met back in the 50's and many couples from the early 1900's to present still meet! We love our quiet neighborhood, it's centrally located and on a quiet street! We are minutes to the Springwater Bike trail and we provide bikes, just let us no in advance and will have them ready! The trail takes you into downtown Portland in approximately 25 to 35 minutes. We love the North Milwaukie area because of the gorgeous Willamette and Clackamas River. A few years ago my son walked to the Clackamas River and caught a huge salmon! He was walking home with the 2 foot salmon hanging over his shoulder and all the cars of people going to work were honking at him! It was one of his proudest days! We love and appreciate the northwest because my father took us hunting and fishing up on the Willamette & Clackamas Rivers as children (a 45 minute scenic drive). We thought everyone lived in such a beautiful place. Not until we moved away for 10 years to Lake Havasu Arizona did we realize how unique Portland was! 5 Minutes to the new Tri Met Orange Line MAX station! toilet, combination tub/shower, tub, shower, Beautifully newly renovated! Pictures don't do the accommodation justice - so peaceful, quiet, clean, wonderful, relaxing. We'd love for Laura and Randy to adopt us (even though we're in our 50's & 60's) - the location is just over a mile from Sellwood with great restaurants, brew pubs etc. The accommodation was everything posted on the site and more! Lovely skylight in the living room area - lots of windows - plenty of lights to read by - use of laundry on request - and the kitchette offered everything we needed. Bed was comfortable, good water pressure - water was hot (let it run a minute or two) and SPACE... lots of closet space in bedroom AND in the bathroom!! We were there for a week and frankly... we're thinking of downsizing - we were so comfortable. Ton's of parking on the street and as you walk up to the private entrance onthe side of the house there's grape clusters. We hope you'll have us back! Thank you for your kind words! We would love to adopt you...buy it might be awkward:) you were truly delightful guests. We hope to see you again in the near future! Safe travels you two!!!! We loved our stay in this adorable little cottage. Well appointed with everything you need for comfortable getaway stay. This property is located in a neighborhood that is not very close to amenities such as restaurants or stores. It might be best to have a car or feel comfortable with a car service such as Uber, if you plan to make the trip into Portland or surrounding communities. Laura was very attentive and answered all of our questions. Thank you again Laura for providing us with such lovely accommodations. This adorable cottage was the perfect place to stay during our time in Portland. 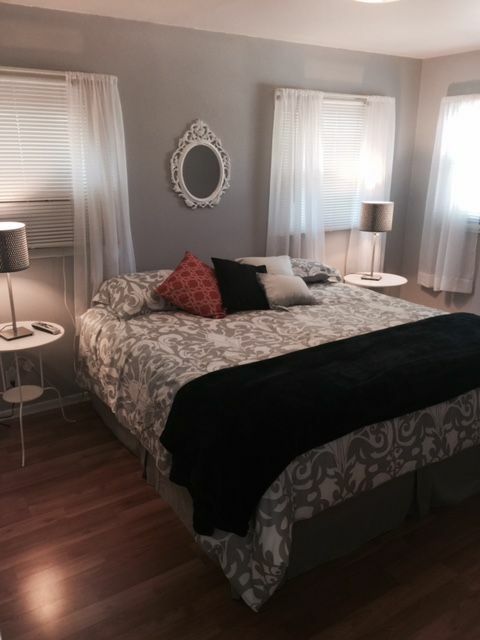 It is a great size for 2 people, well maintained, and tastefully decorated! It also was reasonably close to downtown, activities, and restaurants. I would definitely stay here again! The cottage was very comfortable, quiet and cheerful. We had a lovely stay. We highly recommend this cottage. We have stayed at several HomeAway locations and this one was the most comfortable. The king size bed and the living room chairs are very comfortable. The futon makes a comfortable bed. There is a full closet with plenty of room for clothes and suitcases. The kitchen is well stocked with utensils, coffee, etc. The bathroom has shelves, a drawer, and a nice counter. The cottage is nicely decorated and we felt truly at home. We stayed 3 nights and paid $105 per night + service fee. On the surface everything looks nice, but there is a safety issue with the outlets and wiring here. No GFI outlet by the kitchen sink, or the bathroom sink. In general the outlets are so old, our "phone and computer chargers" fell out of the outlets. One key was provided for two of us! I asked for a second key and it was left the next day. The location was great for our 10 day stay in Portland. We strive to create an extremely safe, hospitable, cozy, and quiet cottage. We have replaced and upgraded the outlets as soon as we found out there was an issue. Had we found out the guests were unhappy, we would have remedied the problem within the day! We thoroughly enjoy our guests and look forward to hosting many more in the future! This charming one bedroom apartment/cottage is in a quiet neighborhood in beautiful Milwaukie. Located 13 minutes from downtown Portland, 4 minutes from Max Transit station, 13 blocks from Providence Milwaukie Hospital and 18 blocks to the beautiful Willamette Waterfront. We are five blocks from the Springwater Bike Trail which you can ride into downtown Portland. We provide bikes upon request! The cottage house is located a few blocks from public transport to downtown shopping, museums & theaters, as well as the Mt. Tabor Park for hiking & bike riding & the historic SE Hawthorne shopping district. Private entrance, easy on-street parking, private garden setting & outdoor sitting area. (small outdoor propane grill & extra outdoor seating available upon request). The cottage has two high def televisions, Wifi and a rich sounding I-Pod bluetooth dock. Several games & books also available. During your stay, please enjoy yourself, don't hesitate to ask any questions or suggestions of places to go & things to see. Washer & Dryer are available in the main house. No smoking inside the cottage. If issues or questions arise during your stay please notify me immediately so that I can address things as soon as possible. I want to make sure you have a great stay. You'll love the clean, quiet and cozy little get away!